Experience what shooters around the world are calling the ultimate varmint hunting platform when you transform your standard AR into a 22 Nosler. 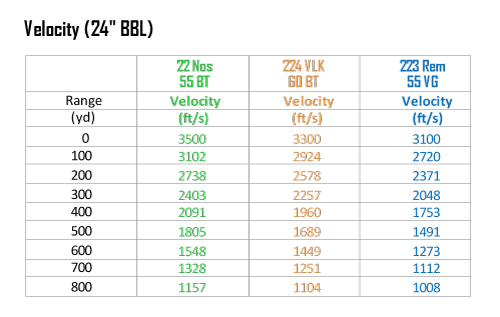 Approaching 22-250 velocities in a significantly smaller package the 22 Nosler yields 25% more case capacity than the 223 Rem/ 5.56 NATO, resulting in 14% more velocity and 30% more energy at the muzzle. The effortless two-step conversion allows shooters to achieve lightning fast, hard-hitting performance with popular varmint bullets, pushing a 55gr. Nosler Ballistic Tip at supercharged speeds of 3,350 fps and a 77gr. Custom Competition bullet at 2,950 fps. The 22 Nosler case holds 34.2gr H2O at overflow, and 31.2gr H2O with a 55gr Ballistic Tip® seated to 2.260” OAL. For comparison, a 223 Remington case holds 27.4gr H2O with a 55gr BT seated at 2.260” OAL. The 22 Nosler has almost 25% more case capacity than the 223 Remington. Bolt face dimensions are identical for the 22 Nosler and the 223 Remington / 5.56 NATO at .378”. With standard use, you should see approximately 2,000 rounds when used in competition and as many as 4,000 rounds when used as a plinking rifle. However, this depends on how well the barrel is treated and cleaned. Nosler® Match Grade Ammunition consists of Nosler’s precisely-designed Custom Competition® bullet along with Nosler® brass. Because of Nosler’s unsurpassed quality standards, each piece of brass is checked for correct length, neck-sized, chamfered, trued and flash holes are checked for proper alignment. Trophy Grade™ VARMINT Ammunition consists of the venerable Ballistic Tip® VARMINT bullet or the frangible Ballistic Tip Lead Free along with Nosler® brass. Because of Nosler’s unsurpassed quality standards, each piece of brass is checked for correct length, neck-sized, chamfered, trued and flash holes are checked for proper alignment. 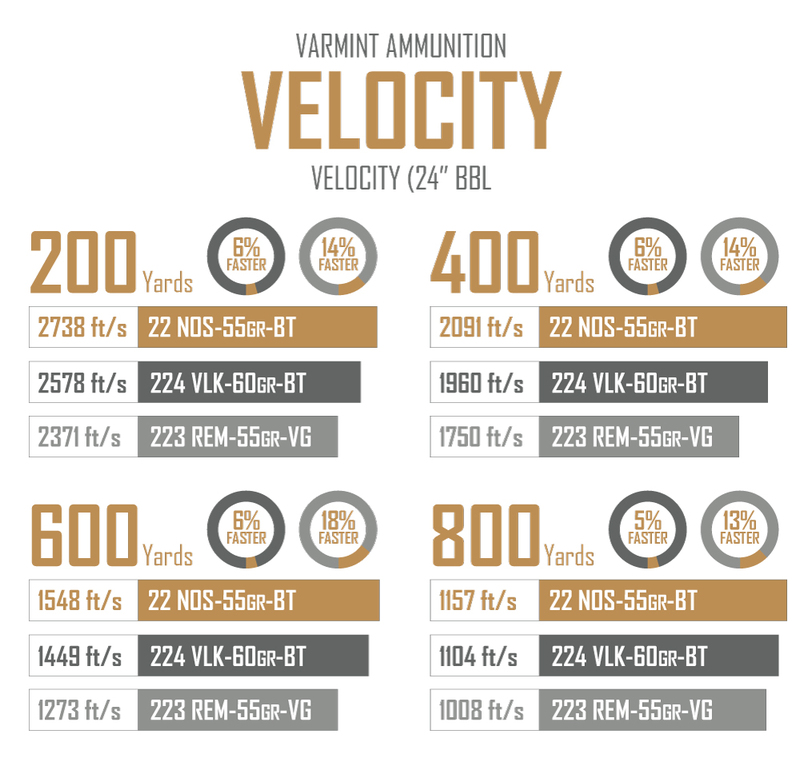 Nosler’s Varmageddon® line of loaded ammunition and component bullets. Featuring a highly accurate polymer tip or hollow point combined with a flat base design, Varmageddon® products were created for the high-volume varmint shooter who requires the utmost precision. In addition to our premium line of production rifles, we offer a Custom line of rifles, allowing you to design the Nosler Rifle that is perfect for you. Thinking of a new rifle for your long-range antelope hunt? We can build a rifle for that. Or, are you dreaming of a classically-styled magnum for your first trip to Africa? We can build a rifle for that too. We know that off-the-shelf rifles do not fit everyone, and our Model 48 Custom Rifle line offers plenty of choices. The Model 48 Liberty™ possesses all the traits that have earned Nosler Rifles a reputation for fantastic performance and robust dependability. Featuring a lightweight synthetic stock, top quality components, and protected by a hearty all-weather finish, the Model 48 Liberty Rifle is ready for any condition Mother Nature has to offer. The Model 48 Heritage combines classic styling with modern engineering and top of the line components, for a rifle that is as beautiful as it is functional. The fancy-grade, oiled walnut stock has been carefully designed for a seamless fit between the shooter and rifle. With a delicate palm-swell, slender forearm, and shadow-line cheek-piece, the Model 48 Heritage just feels right. Built by Noveske Rifleworks in Grants Pass Oregon, the Varmageddon rifle includes features and components typically found only on custom rifles. Offering a 300 fps increase in muzzle velocity over the .223 / 5.56, the 22 Nosler cartridge brings a new level of performance to the Varmageddon rifle series. The new CMMG Mk4 rifle line in 22 Nosler is engineered to deliver on long-range accuracy and high-energy performance. The receivers are made of forged 7075-T6 AL. Superior long-range accuracy, combined with a lightweight configuration, makes the Mk4 in 22 Nosler the perfect choice for your next predator hunt. The new CMMG Mk4 V2 rifle line in 22 Nosler is engineered to deliver on long-range accuracy and high-energy performance. The receivers are made of forged 7075-T6 AL. Superior long-range accuracy, combined with a lightweight configuration, makes the Mk4 in 22 Nosler the perfect choice for your next predator hunt. Build the perfect load has long been the motto of hand loaders loyal to Nosler brand bullets–and was the sole reason we developed Nosler® cartridge brass. Introduced in 2005, the Nosler® cartridge brass line is ready to load. Manufactured with the traditional Nosler philosophy of uncompromising attention to detail, Nosler® cartridge brass is created to exact dimensional standards and tolerances, using quality materials for maximum accuracy and consistency potential while extending case life. Nosler bulk brass was created for high-volume handloaders that want Nosler quality brass, but don’t need it to be prepped. Nosler bulk brass is manufactured from the same materials and to the same tolerances as Nosler’s prepped, boxed brass, but rather than being prepped, and weight sorted, Nosler Bulk brass is bagged raw in 250ct. bags to provide you with the best raw materials for creating your perfect load. The WOA 22” Varmint Upper, chambered in 22 Nosler, is an extremely accurate upper. Whether you’re hunting or just punching paper, this upper is a great choice. The 1-12 twist barrel is optimized for lighter varmint loads. This varmint upper features a stainless steel match grade barrel with an 11 degree target crown chambered in 22 Nosler and uses a standard bolt. The barrel utilizes our exclusive White Oak Armament Competition Barrel Extension. For optimal functionality, we use a match rifle gas system, which utilizes an extended gas tube. The aluminum handguard is black hard-coat anodized for durability and ventilated to assist in cooling. The WOA 3” rail kit is also included, this allows you to customize your tube with either two bipod/sling swivel studs or a 3” piece of rail at the bottom front of the tube for attachment of a bipod, sling or other accessory. The bolt carrier group and charging handle are included. Built by Noveske Rifleworks in Grants Pass, Oregon, the Nosler/ Noveske Varmageddon Upper chambered in the powerful 22 Nosler, brings break-neck velocities to the AR platform. Available in 16”, 18” or 20” barrel lengths with a 1-8 twist, this upper has all the bells and whistles to complete your ultimate varmint rifle build.